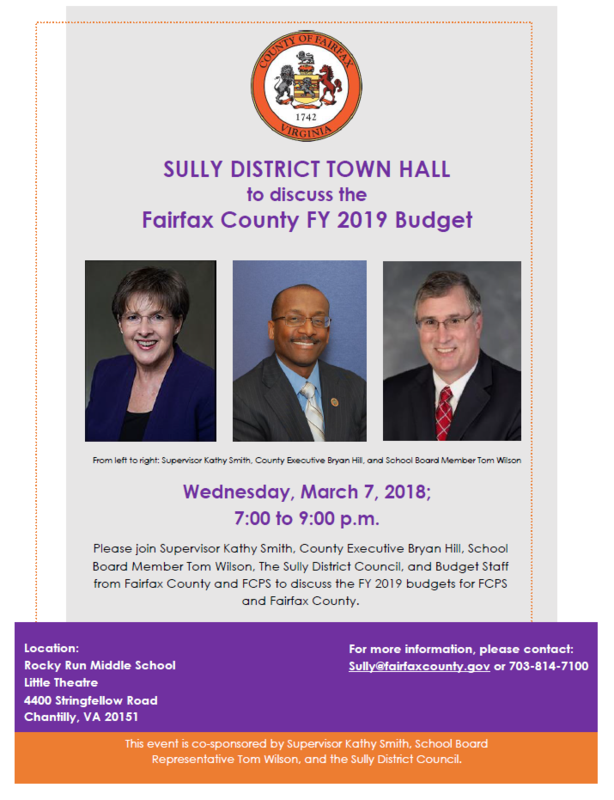 The Sully District Council of Citizen Associations will meet at 7 p.m. on 7 March 2018 in the Rocky Run Middle School, Little Theatre located at 4400 Stringfellow Road, Chantilly, VA This meeting is on the first Wednesday of the month The meeting will be canceled if Fairfax County Schools or after school activities are canceled due to adverse weather the day of the meeting. The joint SDCCA Land Use and Transportation Committee and the WFCCA Land Use Committee met on 6 March 2018 (see their agenda). Pender United Methodist Church Proffer condition amendment to permit expansion of administrative areas of the church, and to permit expansion of the existing preschool through a concurrent special exception. Cocktails starting at 5:30 p.m. with the Program starting at 6:30 p.m.
For more information please contact the Awards Committee Chair. Next month's meetings will start at 7:00 PM in the Sully District Governmental Center Front Meeting Room, 4900 Stonecroft Boulevard, Chantilly, VA, 20151. The April meeting of the Sully District Council membership will start at 7 pm on 24 April 2018, on the Fourth Tuesday of the month to avoid a conflict with the Park Authority Board montly meeting. The Joint Sully Land Use and Transportation Committee is changing its meeting night. Instead of the first Tuesday of the month it will start meeting on the third Monday. The time and location will remain the same. The next meeting will start at 7:00 pm in the back conference room on Monday, 16 April 2018. At this date there are no issues scheduled.